When Jesus was on the earth, He gave His 12 Disciples power, “to heal all manner of sickness and all manner of disease” (Matthew 10:1). This power is called the priesthood. The priesthood is the eternal power and authority of God. It is the power to cure illness and lift burdens. Jesus gave Peter, James and John priesthood keys to lead His Church when He was no longer on the earth. 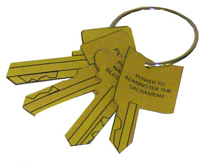 The keys of the priesthood are the authority God has given to direct and exercise priesthood power. Priesthood keys allow us to perform ordinances like baptism, and allow us to go to the temple and be sealed together as a family forever. The Prophet holds all the priesthood keys on the earth today, just as Peter did. What is the power the Savior gave His Twelve Disciples? How does the priesthood bless our family? Ten-year-old Libby hugged her father’s neck as he carried her in the house from the car. “Can you put the hospital bed next to the window, so I can watch my friends playing?” she whispered in his ear. “Anything you want, Princess,” he whispered back. “Mother, may I take three baby steps?” called Tia. “Yes, you may,” answered Emma. Emma looked puzzled. “Fifty steps? That would put you clear across the street!” she exclaimed. Tia nodded towards the window where Libby lay watching. Emma turned to see what she was looking at and smiled. “Yes, you may!” she answered. Tia crossed the street as she counted out loud, “one, two, three…forty-eight, forty-nine.” At the count of fifty, she rang the door bell. Mrs. Langdon looked surprised when she opened the door. Mrs. Langdon looked worried, but then smiled and opened the door for Tia. “We just got home yesterday. You can visit, but just for a little while. She’s still a very sick little girl,” she said as she lead the way to Libby’s bedroom. “Better now that you’re here!” Libby laughed. The two girls talked and giggled for what seemed an awfully short time, when Mother entered the room. That night, Tia said her prayers and asked Heavenly Father what she could do for Libby. The next morning Tia was so excited that she couldn’t wait to see Libby. Right after breakfast she ran over to give Libby the good news. “Your dad needs to give you a priesthood blessing. I prayed for you and He answered,” Tia announced. Libby’s eyes lit up. “You mean a healing blessing, like Jesus gave, when He was here?” Libby asked. “So, He made it possible for every family to be blessed with the priesthood. Bishops, home teachers, priesthood quorum leaders, and even the missionaries are there to bless families who don’t have a priesthood holder in their home,” Father continued. “So Libby can have a priesthood blessing?” Tia asked. by Margie Nauta Lee © 2007 Living Scriptures, Inc. The keys of the priesthood are spiritual keys that we can not see — given to worthy priesthood holders by the laying on of hands. Play the PRIESTHOOD KEYS GAME to learn about how the priesthood and a few of the priesthood keys work together. 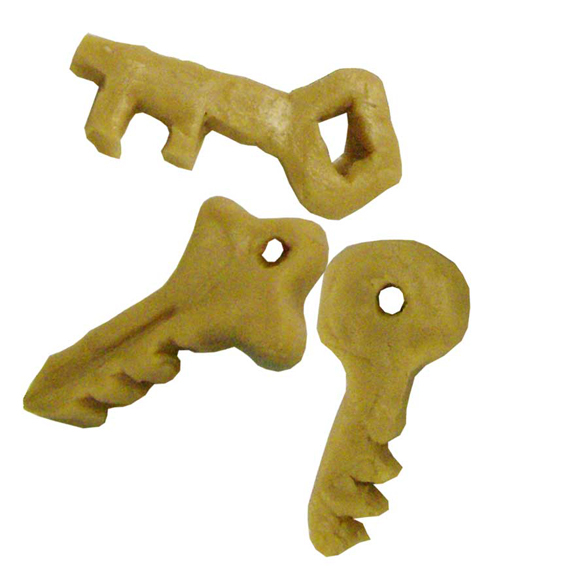 Your family will not only have fun molding PEANUT BUTTER FUDGE KEYS out of this delicious, easy & edible fudge clay, but they’ll have fun eating them, too!